This section is primarily based on research originally conducted by Filip Celander, Ricard Enquist, Klara Friman, Pernilla Karlsson, Emilia Lundqvist, Anna Persson, Elin Rudolfsson, Alexandra Sterne, Linnéa Svanström and Marie Öhnerud. A copy of this group's original work can be downloaded here. The city of Helsingborg is located in the south of Sweden. The city has around 130 000 inhabitants and 11 000 companies, and is home to one of the important harbours in Sweden. Sustainable development has been and is an important consideration for the city's development. The city is also home to an industrial symbiosis network involving various exchanges among a number of private and public actors. The city is seen as the main actor in the development of synergies. Helsingborg is a city where sustainable development is an important issue while developing new areas in the city. For instance, in 2010 the city of Helsingborg signed an agreement with some of the large companies working in Helsingborg, to decrease the environmental impacts caused by citizens and industries in Helsingborg. Furthermore, the municipality of Helsingborg is the owner of the main producer of energy and heat delivered to the city through a district heating system, as well as it owns the local waste treatment company. A publicly owned combined heat and power plant, Händelöverket, was established in an island just outside Norrköping in 1982. The plant was privatized in early 1990s aNordvästra Skånes Renhållning (NSR) handles the region’s municipal and industrial solid waste. As mentioned earlier it is owned by the municipality of Helsingborg together with five surrounding regions; Bjuv, Båstad, Höganäs, Åstorp and Ängelholm. Their main function is to collect existing waste, sort it and either produce biogas, take care of recycled and reusable material, send the burnable waste to incineration, or, as a last resort, place it in landfills. Öresundskraft is one of the biggest energy companies in Sweden. It is owned by the municipality of Helsingborg and consists of six production plants in Helsingborg and four in Ängelholm. The most important plants are Åkerslund, Filbornaverket and Västhamnsverket. Filbornaverket is one of the most modern plants in Europe and has very low emissions. These plants supply Helsingborg with the required district heat, district cooling and electricity. ordvästra Skånes Avlopp och Vatten (NSVA) is responsible for all activities related to water and sanitation in the region, and is owned by six municipalities; Bjuv, Båstad, Helsingborg, Landskrona, Svalöv and Åstorp. In Helsingborg, NSVA operates one of the largest wastewater treatment plants in Sweden, named Öresundsverket. Industry Park of Sweden (IPOS) is an industry park close to the harbour in Helsingborg. The prime industry is Kemira Kemi AB which is a company working with chemicals. IPOS has a number of synergies among the facilities located on its site. These have been studied seperately, and you can find more information on this here. Main resource exchanges between these actors are shown in the figure below and further explained in following sections. Helsingborg is known to have a well organized system for waste collection and sorting. This makes it easy to maintain a good quality of the waste which makes it an important output from the city. Both municipal and industrial solid waste from the region is delivered to NSR. Due to the waste sorting system NSR is able to process and send large amounts of sorted waste, such as paper, plastics and other recycled materials, to distributers in Europe. 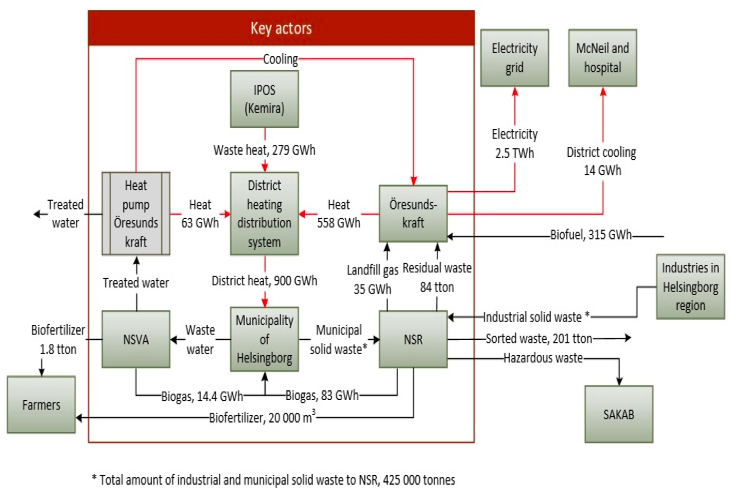 Residual waste that is not possible to sort out to benefit reuse or recycling and is thereby sent to Öresundskraft (Filbornaverket). NSR also provides the plant with gas from landfills. The material that cannot be taken care of by NSR, such as hazardous waste, is sent to Sakab. Västhamnsverket, another plant owned by Öresundskraft, produces district heat by burning biomass and natural gas. It also takes care of heat from sewage water, using a heat pump, and waste heat from the industries in Helsingborg. For instance heat is recovered from Kemira Kemi AB, a chemistry industry in the IPOS area, which is the biggest supplier of waste heat. The Filbornaverket plant was recently built by Öresundskraft on the property of NSR as a collaboration. In this plant, they incinerate residual waste and provide district heat to the city. 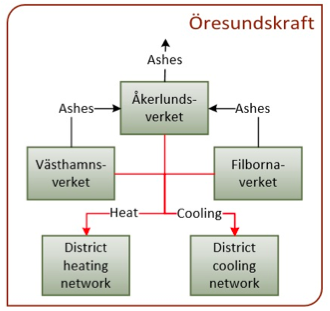 The ashes from Filbornaverket and Västhamnsverket are sent to Öresundskraft´s plant Åkerslund which is located in Ängelholm, where it is burnt together with biomass to recover heat. The Åkerslund plant is outside the system boundaries, and thereby this plant is not evaluated further. Heat and electricity are then utilized in the city of Helsingborg by both industries and households. District cooling is distributed to the city and used by the hospital of Helsingborg and a company named McNeil AB. Figure 2: Different Divisions of Öresundkraft. Since Helsingborg has a well established harbour, tons of groceries pass through the city, to be stored a couple of days before it continues to the rest of Sweden. It is therefore easy to find stocks belonging to companies such as Unilever (producers of margarine, cream etc) and ICA in Helsingborg. These industrial waste streams make them all big suppliers of biological waste, which is taken care of by NSR. By digesting this biological waste, NSR is able to produce biogas which is distributed to Helsingborg’s industries and municipality through a system owned by Öresundskraft. For instance the biogas is utilized as fuel in the buses in the Helsingborg region. Biogas is also produced by NSVA. Sewage water, another big output from the municipality is sent to NSVA where it is processed in the cleaning treatment. The residual sludge then goes to a plant which includes two digesters where biogas can be produced. This biogas is also distributed by the system owned by Öresundskraft. As a by-product the bioreactors create biofertilizers. Due to its high content of nutrients, parts of the sludge from the bioreactors can be used as fertilizer and it is sent to farmers through pipelines. The agreement between the farmers and both NSR and NSVA provides that the farmers store and distribute the biofertilizers on their lands. There are also some smaller exchanges in the region which benefit the development of the municipality of Helsingborg. The EVAA project is a collaboration between the municipality of Helsingborg, Öresundskraft, NSVA and NSR. Its main purpose is to identify synergies between the involved actors that make it possible to increase the sustainability of the systems, while reducing environmental impact. The focus is on finding integrated system solutions within the areas energy, water, wastewater and waste. Another such synergy is between Move About and Öresundskraft, who have a car pool cooperation where electrical cars are loaded by solar energy. This synergy benefits more sustainable transportations in the region. The different symbiotic relationships in Helsingborg has several environmental benefits. The main ones are a reduced need to produce heat and less demand for different types of fuel. This is due to the fact that excess heat from different industries in Helsingborg can be utilized mainly in the district heating system. Furthermore, natural gas can be replaced with biogas which is a by-product from for example wastewater treatment. Another benefit from the industrial symbioses in Helsingborg is a reduced number and distance of transportations by linking the different companies, which results in reduced emissions. Further, the different symbioses also lead to a smaller volume of waste placed in landfills, especially since much of the waste is recycled and a lot of the remaining waste is used for combustion. An additional benefit is that farmers in the area substitute some of the mineral fertilizers with a nutrient-rich sludge, which reduces the demand for finite phosphorus rock and fossil natural gas. Moreover, the choice made by the municipality and the companies to work together for environmental gain, brings awareness of environmental issues to the population of Helsingborg. It is often difficult to quantify economic benefits that derive solely from industrial symbiosis, partly because such data has a confidential nature, and partly because such calculations are complicated. Generally speaking, one could argue that achieving more regional synergies simultaneously improves the region’s economy. Of course this differs from case to case, but replacing raw material and energy inputs with waste flows from other actors should be economically sound. In the case of Helsingborg, there is an established network of energy and material flows between the key actors NSR, Öresundskraft and the municipality of Helsingborg which is economically beneficial. To name an example, the heat exchange between Kemira Kemi AB and Öresundskraft allows decreased energy costs for the first part, and increased incomes for the latter. In 2012 Öresundskraft had the best annual profit ever, which of course depends on several factors but where industrial symbiosis is likely to be one of them. A large part of the synergies in the Helsingborg region concerns solid waste. Thus, a geographical proximity should have a relatively large influence on the total cost advantage. Furthermore, a focus on industrial symbiosis can help improve the environmental trademark of Helsingborg city, which in a longer perspective is likely to result in business benefits. By interviewing actors behind the industrial symbioses in Helsingborg a few factors have been identified as highly important for the facilitation of industrial symbioses in Helsingborg. To establish the kind of industrial synergies studied actors must first establish trust for each other. This trust is preferably created through personal relations between a few actors in the top level management of included companies. Building this relation of trust might be time consuming, as in the case of Öresundskraft and Kemira Kemi AB, and it seems that such a relation can neither be forced nor facilitated through official meetings or instituted networks. If a synergistic linkage offers no business opportunity for a private company, the linkage will not be established. However a business opportunity doesn’t necessarily have to give direct financial gain but can affect for instance goodwill or image of a company. Evaluating business opportunities is however rarely a good starting point in facilitating industrial symbiosis. Without any relation of trust established between companies the risks associated with most business opportunities will most likely appear too high in relation to the possible benefits. In the case of the co-investment in a solar powered car pool made by Öresundskraft and Move About, strong entrepreneurship and good leadership helped overcome the obstacles mentioned earlier. The large infrastructural synergies established between Öresundskraft, NSR and the municipality of Helsingborg are not likely to have existed without common municipal ownership. Even though there are profit interests, this ownership structure allows for substantially longer timeframes for investments. The municipal ownership induces trust and dependency between companies and politics. As an example Filbornaverket was made possible through the politically established waste monopoly. This provides Öresundskraft with a secure input of waste to fuel their CHP-plant and at the same time providing the municipality of Helsingborg with a sustainable output channel for their waste. A part from the key enabling factors mentioned above a set of drivers and barriers have been identified. These derive from interviews with actors behind the industrial symbiosis in Helsingborg. Politics play a major role acting as a driver or barrier for industrial symbiosis, mainly through its most powerful policy instruments; laws and regulations. It seems however that it is not the laws and regulations themselves that act as barriers, but rather the uncertainty of their future development. As an example the discussion of deregulating the district heating market forces companies into shortsighted strategies in that area. There are however also examples of existing laws that themselves act as barriers. One such example is the law of public procurements which is based on a market model where the value of industrial symbiosis is not at all visible. There are also examples where laws act as drivers for industrial symbiosis. As an example landfill bans enforce municipalities to make better use of their waste, in many cases through synergistic linkages similar to the ones in Helsingborg. At a regional and local level politics have more of a hands-on impact with decisions directly affecting the area which they govern. Municipalities may to some extent affect the geographical placement of industries through city planning and zoning. In this way they facilitate industrial symbiosis by helping companies overcome potential geographical barriers. At regional level good relations between municipalities facilitates synergistic linkages, as in the case of the district heating corridor between Helsingborg and Landskrona. All stakeholders are somehow affected by the municipality in which they operate. This gives municipalities a great possibility and responsibility to act as a visionary for the future development of itself and stakeholders operating within it. At a company level organizational politics and structures can be a great barrier to industrial symbiosis. Companies, such as Unilever, often have centralized top management with low interest in synergistic opportunities at the local level. Beyond financial aspects CSR-profiling is one of the few drivers for companies to establish industrial symbiosis. The international impact of such profiling at a local level is believed to be minimal, reducing interest from centralized management. With low local presence of top management it is also difficult to establish the vital relationships mentioned earlier. Lacking knowledge of possible synergistic linkages and the circumstances needed to realize them is a major barrier to industrial symbiosis. Companies most certainly have the abilities to acquire such knowledge but most likely lack the resources. To initially overcome this barrier academia can play a major role, for instance through projects like this one. Instituted networks are a possible way of sharing knowledge between companies even though the effectiveness of such networks is questioned by some. An interviewee expressed that such networks rarely go beyond the activity of drinking coffee. There are a number of additional symbiotic linkages that are already planned or that can be further studied. The possible future symbioses which have been recognised in this project are described shown in Figure 3 and are further described below. The municipality of Helsingborg and Öresundskraft have plans to expand the district heating system to Lund, Helsingör and to other industries in Helsingborg. The extension to Helsingör requires cooperation with Denmark. Obstacles are legislative since permission is needed from both the Danish and Swedish environmental authorities, as well as the county government. Västhamnsverket produce district cooling to the hospital of Helsingborg and McNeil AB. 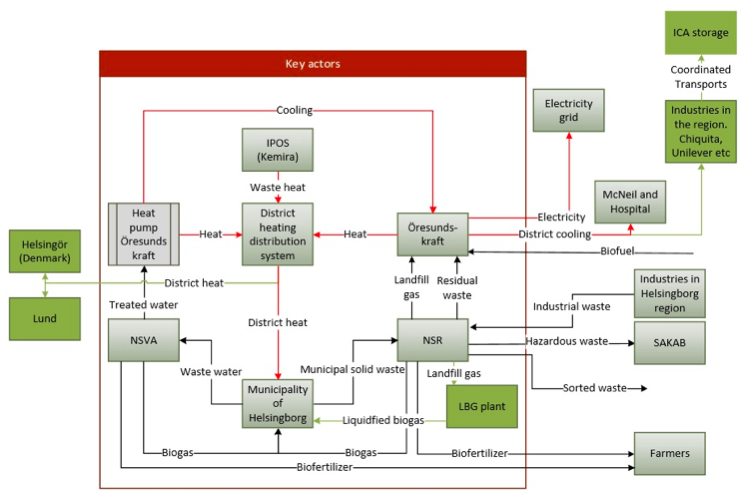 There is potential to expand the district cooling network by absorption cooling which can make use of the district heating network. The municipality needs to find a partner in order to do this. As mentioned in barriers, there are several industr ies in Helsingborg who do not have the top management in the city but is controlled from a remote location. In order to create future linkages between these industries, it is possible to coordinate such synergies with the owners of the industrial areas. For example Unilever and Chiquita could benefit greatly by using district heating/cooling instead of electricity for heating and cooling. The best way to do this is probably by involving the company who owns the premises, Wihlborgs, since there are several companies in the area who use electricity for heating and cooling today. The cold water temperature is 6 degrees which for example fits Chiquitas needs perfectly. Another example where Wihlborgs can create more linkages is to use the already existing tracks connecting Chiquita and Unilever to the ICA Storage. This way trains can be used instead of trucks. Wihlborgs can coordinate the administrative and logistical work required to arrange the trains and organize the train timetable. The municipality and NSR plans to build a plant to produce liquefied biogas (LBG). This will be one of the world's biggest production plant of LBG. If they can find a partner the plant will be built on NSR's Recycling in Helsingborg. The technology that will be used produces clean liquid biogas, completely CO2 neutral. The plant will purify methane gas from its landfill and biogas plant and is expected to be producing about 25 million litres of liquid biogas annually, replacing over 14 million litres of diesel or gasoline per year. H+ is a large project between the key actors involved in EVAA (which is mentioned above). It is an urban renewal project were they work together to create a more environmentally conscious area in the port as well as creating a more attractive urban area. The area is about 100 hectares in the south of Helsingborg. There will be a lot of new infrastructure in the form of ferry berths, roads and rails as well as water, electricity, telecommunications, optical fibre, district heating and gas. Additionally, there might be new infrastructure for cooling, automated waste collection (suction) and separated sewage. The separated sewage is a step taken to create more biogas. This means there are a lot of new synergies in the area. Another incentive for the H+ project is to reduce energy use by creating a higher awareness as well as energy efficient buildings and increased utilization of biogas fuelled transports. There are other possible synergies in Helsingborg, where one is the business incubator on NSR’s property. The incubator is meant to help new innovative enterprises develop and achieve commercialisation. They are placed alongside more established companies, which provide the opportunity to exchange ideas, share knowledge and make contacts, and of course discuss ideas for future symbioses. Cassandra Oil AB has a contract with NSR and they will establish material waste operations in NSR’s recycling. The reactor technology involves using catalytic cracking to break the bond between the hydrocarbon chains which creates fractions of oil. This partnership makes it possible to produce oil from hydrocarbon materials, such as used tires, plastic waste, oil sludge and waste oil. Cassandra Oil will be able to process waste material from other operators as well. Another future symbiosis is the Recycling Park Filborna which is a project between NSR and Öresundskraft, on NSR’s property. The main objective is to reduce the landfilling and increase the recycling. There are plans for an industrial symbiosis park like the one in Händelö (Norrköping), where the incentive is to reduce the energy use by mainly using other companies’ by-products. It is also possible to produce process steam, but the industrial areas in Helsingborg are scattered and therefore it is difficult to exploit synergies with steam. As mentioned in Drivers and barriers the municipality might be able to influence where the industry establishes itself so that future synergies are possible. It should be noted that the municipality is considered to have an important role for facilitating the realization of these synergies. This can be achieved, for example, by bringing companies together to start discussions of new synergies and current flows.